This is the first of two reviews I’ll be doing of recently-released oversized artbooks I’ve purchased: Buz Sawyer Vol. 3: Typhoons And Honeymoons (Vol. 3) by Roy Crane and the third and final volume of the Alex Toth biography, Genius, Animated: The Cartoon Art of Alex Toth. Back in 2011, Fantagraphics Books launched its planned compilation of seminal cartoonist Roy Crane’s classic adventure comic strip, Buz Sawyer, which ran from 1943 to 1989 (Crane died in 1977 and was lasted credited on the strip in 1979). This third volume in the series collects the strips from July 1947 to July 1949. Crane is a seminal figure in newspaper comic strip history because he was among the first cartoonists to introduce cliff-hanger style adventure into what until Crane had been a standard low-brow, gag-a-day medium. I’ve written several times about Crane’s legacy and his influence on my own work, most notably here. 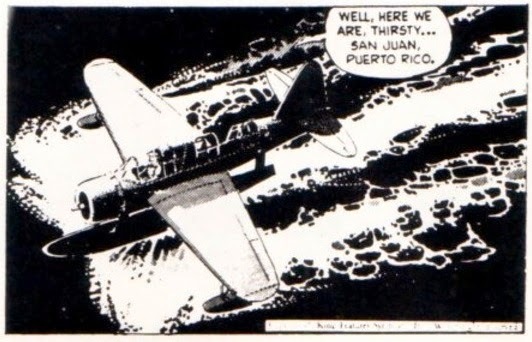 Though Crane may not have quite reached the popularity and heights of his adventure strip contemporaries like Milton Caniff (Terry and the Pirates and Steve Canyon) or Alex Raymond (Flash Gordon), his work was much respected by his peers. Cartoonists as diverse as Caniff and Charles Schulz (Peanuts) have credited Crane as an important direct influence. Crane may have been ultimately surpassed by artists who took the adventure strip genre to a higher level in sophistication and realism. But beneath a deceptively simple cartoony art style, Crane nevertheless remained second to none as a draughtsman, able to capture atmosphere, place, and time of day with great effectiveness. As I mentioned in my earlier appreciation linked above, Crane’s work reflected solid mid-Western American values and a vibrancy that was not easily replicated. Crane cemented his reputation with an earlier series, Wash Tubbs, which began as a classic big-foot humor strip in 1924 and evolved into what is considered among the first adventure strips. The turning point of the series came with the introduction of two-fisted soldier-of-fortune Captain Easy, who soon relegated Wash to second banana status. The strip was eventually re-named Wash Tubbs and Captain Easy. When the strip began during wartime, Buz was a naval pilot in the Pacific, based on an aircraft carrier. In the post war, he became a globetrotting troubleshooter for private industry and, during the strip’s later years, a naval intelligence officer. Though this is the third volume of the series, it’s the first of the new compilation I’ve purchased – primarily because I already own the earlier strips in prior collections. The third volume has Buz working for Frontier Oil, preventing a revolution in South America, facing off against an international fixer Harry Sparrow and his henchman Hammerhead Gool. I was also surprised to see Crane marry off his lead character so early in the strip’s run, only about four years in — surprised because the normal convention for such series is to keep the characters footloose and far from being settled down, to keep readers in suspense. Clearly, Crane thought the idea of a married adventurer would lead to fresh storylines and challenges. A couple of other observations about this collection…. Like most comic-strip artists, Crane used assistants. Indeed, Crane had several who were very fine artists in their own right and, compared to some other strips I’ve seen, I’ve rarely seen any inconsistency or lapse in quality in Crane’s work. So it was interesting to see in this volume a series of strips, from late August to early September 1948, which clearly was the work of another artist and one who fell short of Crane’s usual high standards. The introduction by series editor Rick Norwood also offers some interesting insights into Crane the man, quoting extensively from a letter that Crane included with the art and personal papers he donated to Syracuse University. Although Crane’s points are well taken, they nevertheless expose a measure of professional insecurity and competitiveness over his more successful peers. (Indeed, for all his complaints over stolen ideas, I always felt that the introduction of the female character of “Sultry” into Buz Sawyer, who briefly cameos in this volume, was an obvious-but-rather watered-down attempt to capture what Caniff had achieved with his larger-than-life Dragon Lady.) Written in retirement near the end of his life, Crane’s writings also reflect some weariness over the grind of producing a comic strip and questions whether his dedication to the strip was worth it. It is invaluable record to have Crane’s thoughts, comments and remembrances in writing and in his own words. But I must admit they were also a bit deflating and disappointing. 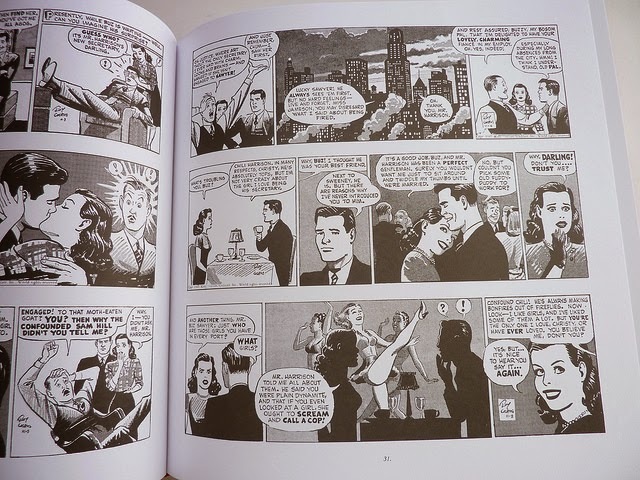 To most everyday people who are familiar with the work of Charles Schulz and, to a somewhat lesser degree, Milton Caniff, Crane is relatively unknown. 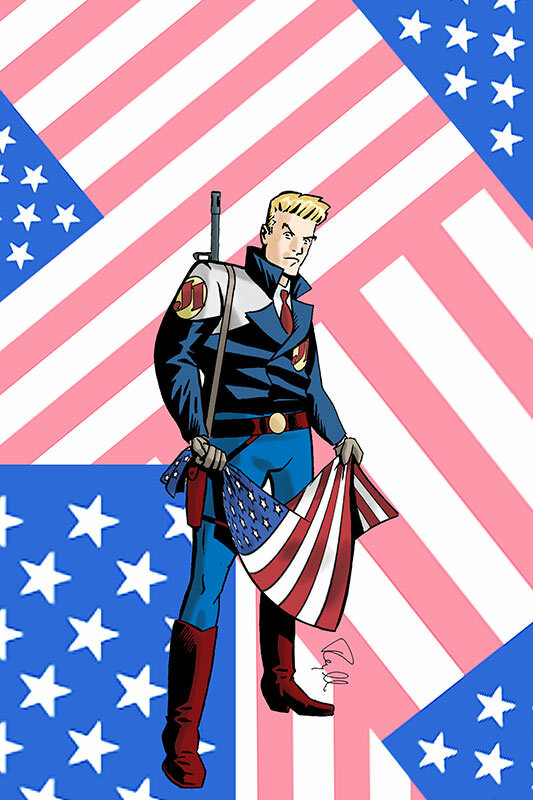 Nevertheless, as the continued collections of his work shows — including Wash Tubbs in a 17-volume collection published in the 1980s and early ‘90s, and prior collections of that strip and of Buz Sawyer, including the present compilation — the power of Crane’s work and achievements can speak for themselves. His work has clearly stood the test of time, remaining fondly remembered and in print for future generations, highly respected by comics fans and aficionados. A review of Genius, Animated: The Cartoon Art of Alex Toth, will follow soon. It's notable that Toth was a huge admirer of Crane, and though Toth was often praised as following the footsteps of Milton Caniff, his philosophy of cartooning was actually much closer in approach and style to Crane.